Sweet and spicy, our cajun chicken dinner is a winner! Originating from the US state of Louisiana, cajun spice is a distinct blend of paprika, garlic and cayenne pepper that brings this dish to life. 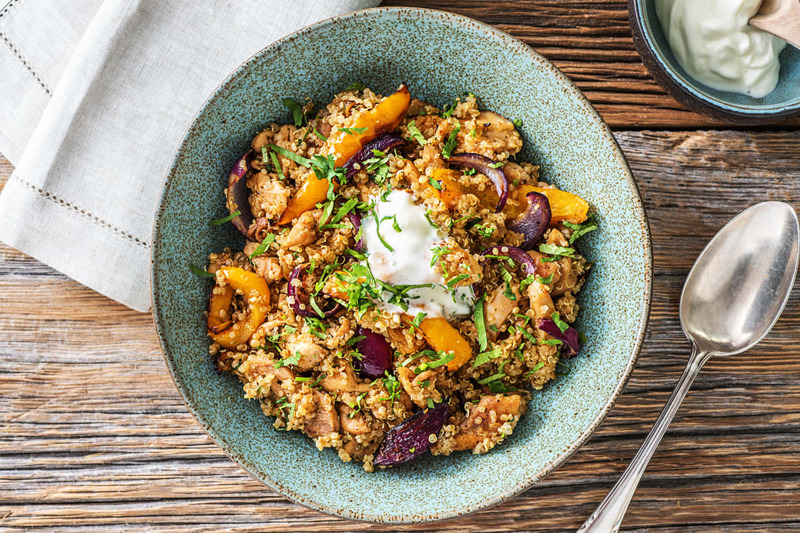 Spicy chicken, sweet apricots and roasted vegetables with nutty light quinoa topped with sour cream and a little coriander. 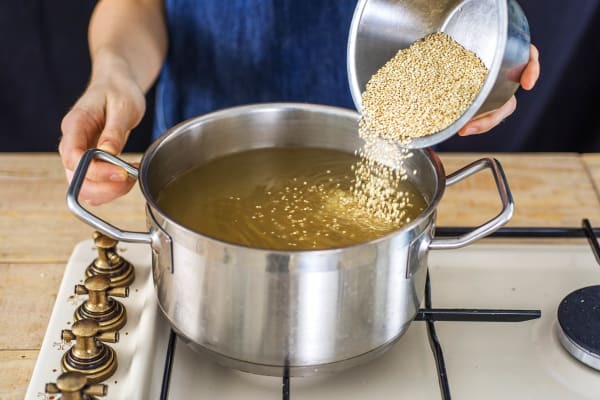 Preheat your oven to 200°C and bring a large saucepan of water to the boil for the quinoa. 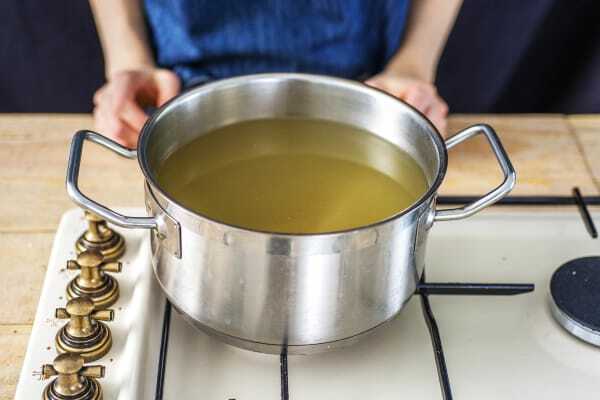 Stir in and dissolve the stock powder. Halve and peel the red onion, then chop each half into six chunks. Halve, then remove the core from the pepper and cut into 1cm slices. 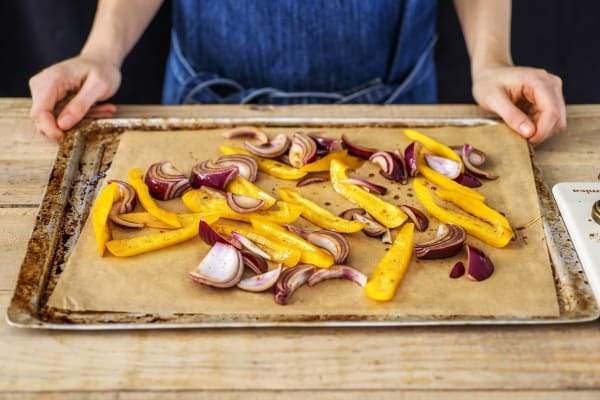 Place the onion and pepper on a lined baking tray and drizzle over some oil, the balsamic vinegar and a pinch of salt and pepper. 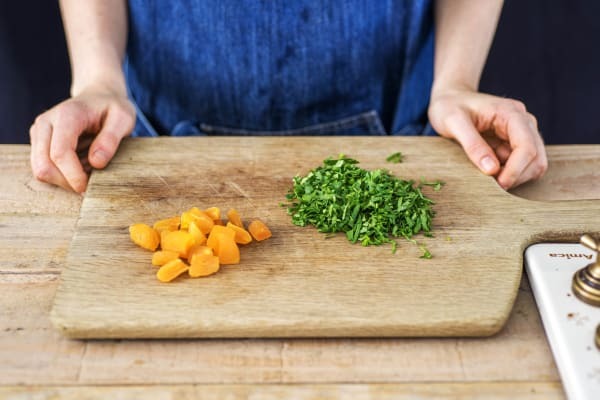 Give the tray a shake and pop on the top shelf of your oven for 20 mins or until the veggies are soft, then remove from your oven. Meanwhile, add the quinoa to the boiling stock and boil it for 12-14 mins, or until tender. Once cooked, drain the quinoa in a sieve, then pop back in the pan with the lid on. Leave to the side. While the quinoa is cooking, cut each apricot into four pieces. Roughly chop the coriander (stalks and all). Cut each chicken thigh into 1cm wide slices. IMPORTANT: Remember to wash your hands and equipment after handling raw meat! 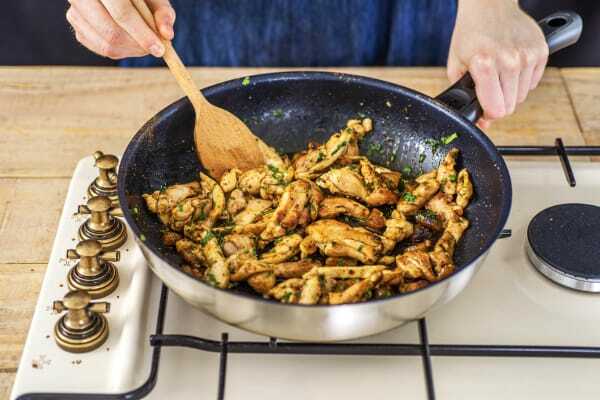 Put a frying pan on medium-high heat with a drizzle of oil. Once hot, add the chicken slices along with the Cajun spice blend. TIP: Add less of the spice if you're not a fan of heat! Cook the chicken until browned and slightly crispy, 5 mins, then add the apricot pieces, half the coriander and all of the honey. Cook for 1-2 mins more or until the chicken and apricots are golden and caramelised. Remove your pan from the heat. 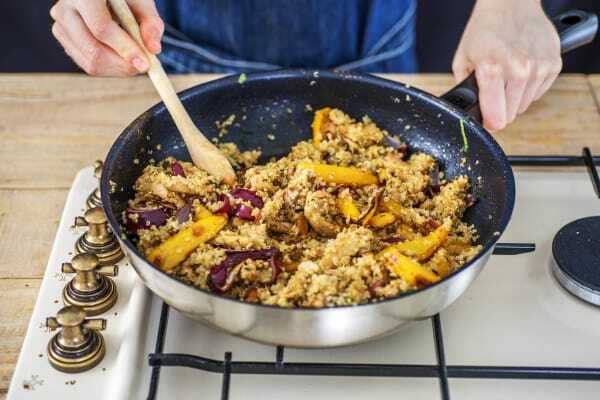 Fluff up the quinoa with a fork and stir in the balsamic roasted veggies, chicken and apricots. Serve in bowls with a dollop of sour cream and a sprinkling of remaining coriander. Enjoy!